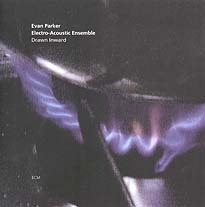 Evan Parker, soprano and tenor saxophones, khène; Barry Guy, double bass; Paul Lytton, percussion, live electronics; Philipp Wachsmann, violin, viola, live electronics, sound processing; Lawrence Casserley, live electronics, sound processing; Walter Prati, live electronics, sound processing; Marco Vecchi, live electronics, sound processing. Recorded December 1998 at Gateway Studios, London. Cover photograph (reproduced above) by Jan Jedlicka; cover design by Birgit Binner.